The Prime Minister of the United Kingdom, David Cameron who made serious headlines all around the world for unguarded comments, has made a new statement. The British Prime Minister David Cameron on wednesday attempted to reverse his unguarded remark about Nigeria and Afghanistan, two countries which on Tuesday, he, described as “fantastically corrupt”, when he was briefing Queen Elizabeth II on the ongoing anti-corruption summit being hosted by the United Kingdom. While briefing Members of Parliament (MP) in the House of Commons wednesday, the British PM said Nigeria and Afghanistan had taken “remarkable steps forward” on corruption. Cameron said the countries’ leaders were “battling hard” to tackle the problem. His attempt at a mea culpa came after Buhari, who arrived London on Tuesday evening for the summit, said Cameron’s gaffe was not reflective of his administration’s fight against corruption. However, when asked yesterday by journalists at the pre-anti-corruption conference in London if Nigeria was “fantastically corrupt”, Buhari candidly replied, “Yes”, adding that corruption in Nigeria was endemic, but his government was committed to fighting it. 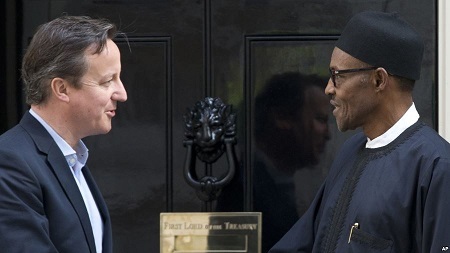 He went on to state that he was not going to demand an apology from Britain or Cameron, making it abundantly clear that he was more interested in the return of Nigeria’s assets held in British banks. “I am not going to be demanding any apology from anybody. What I will be demanding is the return of assets. I have already mentioned how Britain led and how disgraceful one of Nigeria’s executives (former Bayelsa Governor, the late Diepreye Alamieyeseigha) was. He had to dress like a woman to leave Britain and left behind his bank account and fixed assets which Britain is not prepared to hand over to us. “This is what I am asking for. What will I do with an apology? I need something tangible,” he said.